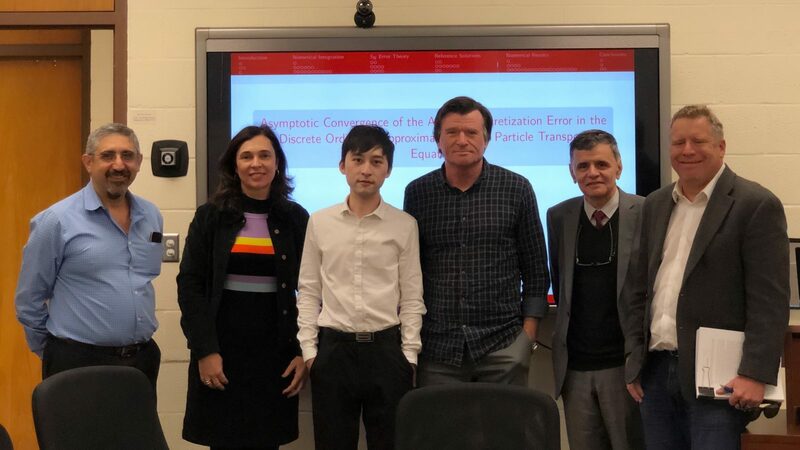 On October 31, Xiaoyu Hu successfully defended his PhD dissertation, Asymptotic Convergence of the Angular Discretization Error in the Discrete Ordinates Approximation of the Particle Transport Equation. Xiaoyu’s committee consisted of his advisor, Yousry Azmy, and members, Dmitriy Anistratov, Kostadin Ivanov, Pierre Gremaud, and Liliane B. Barichello. In this work, the asymptotic convergence of the solution to the discrete ordinates (SN ) ap- proximation of the particle transport equation with increasing quadrature order is examined. Five angular quadrature types with increasing number of angles are considered: Level Symmet- ric (LS), Legendre-Chebyshev Quadrangular (LCQ), Legendre-Chebyshev Triangular(LCT), Quadruple Range (QR) and Quadruple Range Spence-type (QRS) quadrature sets. The quadra- ture rule for generating each quadrature type is discussed and analyzed. The quadrature rule errors over the principal octant/quadrant are examined for the five different quadrature types with increasing quadrature orders. Numerical tests show that the LS quadrature sets can only exactly integrate monomials of even powers up to order N , where N is the LS quadrature order. LS-N , LCQ-N and LCT-N quadrature sets cannot exactly integrate the monomials of odd powers, and LCQ-N quadrature sets can exactly integrate monomials up to order 2(N − 1). LCT-N quadrature sets can only exactly integrate monomials up to order 2. The quadrature errors of QR-x,N and QRS-x,N quadrature sets are dominated by the smallest power that can be integrated by the azimuthal quadrature that has the smallest number of azimuthal angles over all polar levels and by the polar quadrature. We also verified that the quadrature rule errors of integrating some monomials obtained by these quadrature types converge asymptotically with different rates. Based on Madsen’s Theorem, we derived expressions for the error in the uncollided and fully collided region-averaged scalar fluxes and establish their upper bounds. We developed the expressions for exact region-averaged uncollided angular flux and the corresponding uncollided scalar flux in the source region and source-free regions using the integral form of the transport equation. Also, Richardson extrapolation is employed to generate the reference solutions if the true solution is not known analytically. A two-dimensional test problem with a homogeneous, isotropically scattering medium in Cartesian geometry is utilized to determine angular discretization errors and verify asymptotic convergence of the numerical solution to the discrete ordinates approximation of the particle transport equation. The Arbitrarily High Order Transport method of the Nodal type and 0-th spatial expansion order (AHOT-N0) code is employed to solve this test problem, then we use the obtained solution to compute the region-averaged scalar fluxes. The test results show that, in the source region, the region-averaged uncollided scalar flux errors obtained by using LS, LCQ and LCT quadrature sets converge asymptotically with first order in the reciprocal of the number of angles per octant, and such flux errors obtained by using QR and QRS converge quadratically with increasing number of angles. In the source-free regions, the uncollided scalar flux error convergence orders behave the same like the errors in the source region. We offer explanations of why the quadrature error converges with the observed orders according to the regularity of the exact angular fluxes and the product quadrature error theory. For the fully collided scalar flux error, the error analysis will be more difficult since the analytical form of the fully collided flux cannot be derived.